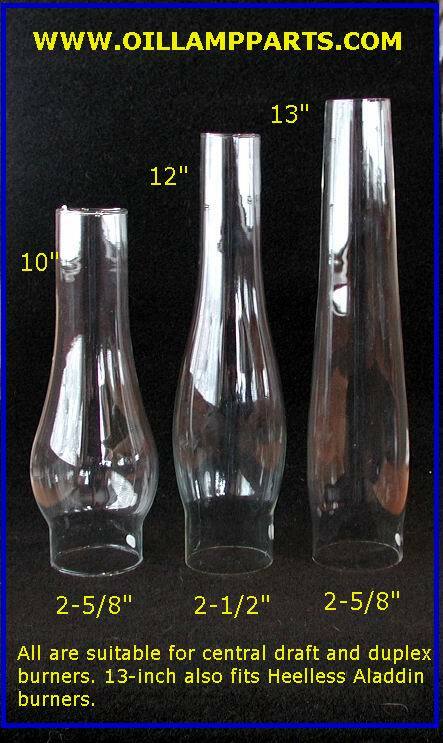 All of these chimneys have a 2-1/2" to 2-5/8-inch outside diameter base, known as size #1. They are designed to fit the larger table lamps that have either central draft or duplex burners. The Central Draft burner is one which has a central open metal tube wrapped with a tubular wick. This central tube provides the air for combustion. These lamps falls into two general categories: GWTW (Gone with the Wind)lamps and Banquet lamps. Normally they are topped with either a ball shade or open topped gas shade. The Duplex burner has a side-by-side pair of flat ribbon wicks, each with it's own wick raiser knob. The 13-inch (12.5") tall chimney is also an excellent substitute for the Aladdin Heelless chimney that sells for $30. It will fit any Aladdin burner models 3 through 11. Caution: The Central Draft and Duplex burners produce a lot of heat. To avoid cracking your chimney light the wick(s) and lower it. Replace the chimney and allow it to warm for a moment before raising the wick to the desired brightness.